The Preview area - The preview area is where you'll be able to see your changes in real-time as you modify your headers. Allowing you to build your header with ease without having to keep entering and exiting the builder. 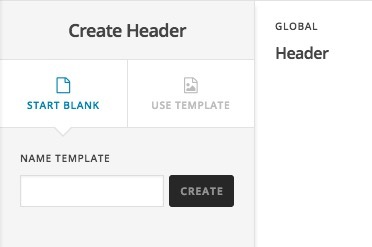 Create Header - This area allows you to select a header template or to start with a blank template and start creating your header! In the center are all the headers that you've created so far, this is a scrollable list that allows you to go through your headers one by one. Clicking on a header will load it in the preview area then if you'd like to work on that header you can just click Edit. Finally, on the right-hand side, we have the header assignments manager. Click on a header, and you'll be able to manage the pages that header is assigned to within that pane. This is covered more in-depth below. Edit - Clicking Edit will open the header builder interface to edit that specific header. Copy - Clicking on Copy will create an exact copy of that header, useful for if you wanted to test a specific change but didn't want to risk messing up your existing header or if you needed to create the same header with one tweak to be on a specific page, rather than doing all that work again just click Copy and it does all the heavy lifting for you! Delete - Clicking Delete will, of course, delete the header in question. Save as Template - Clicking on this button will open up a pop-up which you can add a name to the template and it will be available in the Template Manager. Make sure you have the header builder open, and on the left-hand side you'll see an area that reads Create Header. You either can start creating the header with a blank template or you can choose from the templates you already installed in the Template Manager. You should now see an input to enter the name of your header with a Create button. Go ahead and enter any header name you want. For some naming tips, you may want to name it based on what page it's going to be used on or anything else you'd like. Once you're happy to go ahead and click on Create. Now you've created your header you'll see it in the list of headers you've already created, go ahead and hover over the header and you should see a set of buttons Edit, Copy, Delete, Save as template. 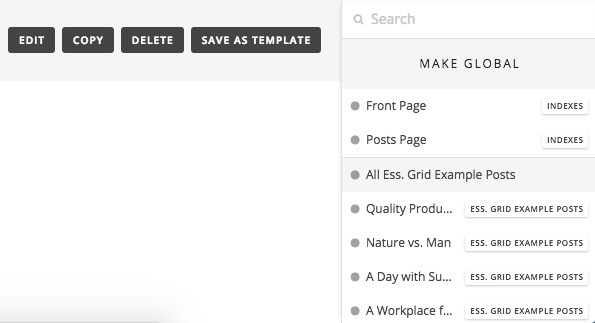 Click on Edit and you'll be entering the compelling world of the header builder! Every header or footer built within their respective builders is made up of three main parts. Bars, Containers, and Elements. Let's explore through more in-depth. Bars are the main part of your header or footer, both headers and footers must always have at least one bar, though a header and footer can be made up of multiple bars. As you can see in the header builder the template we used has one bar. If you click on Add. Go ahead and click on Yes, proceed and that gets you back to what you had already the one bar. Go ahead and click on the magnify icon on the Bar. This is known as the inspector. With the controls, you'll need to play about with the various controls to configure the header exactly as you want it. Taking a look at how the pre-defined templates are setup is always a good place to start and should make you more confident in using the builder itself. when you set varying controls as you want, you may notice additional controls show up. For example just like the advanced option. If you set Sticky Bar to On you'll get an additional set of controls just for the Sticky Bar called Sticky Setup. Allowing you to set various options. If you select PX for the height value instead of EM you can now modify the height value in pixels. Setting VW to 100 would be 100% of the viewport width of the device being used and setting VH to 100 would be 100% of the viewport height. The Header and Footer Builders use a CSS library called Flex Box. Flex Box allows you to have ultimate control over how the content displays and response. While FlexBox isn't the most straightforward thing to grasp, in no time at all, you'll be creating awesome headers and footers like a pro. There are some fantastic resources for FlexBox around the web. One of the best being over at CSS Tricks. It's a lengthy tutorial though well worth having a read through and adding to your favorites. Border controls do exactly as you'd think, control the borders of the bar. You can set the style, the width, and the color. That top option called Link Sides allows you to either link up every side, so the border is the same on all sides. Or if you disable Link Sides you can control the style, width, and color of the border individually per side. The box-shadow controls allow you to set all parameters for a box shadow around your bar, from the X-offset to the Y-offset, how much blur to use and the color. Containers exist within bars and contain the elements. You can have multiple containers in a bar which allows you the ultimate flexibility in creating your headers and footers, from the template we're using all the elements are within the one container. But you can experiment to find the perfect setup for yourself. Max Width - Allows you to set the maximum width of the container. If your content expands the container width it'll start squishing together. Max Height - The maximum height that the container can be. Background - Allows you to set the Background color of the container. This is separate from the Bar background. Which allows you to set a unique background per container. Advanced - Checking the Advanced box shows the advanced background options which enable the Background lower layer controls, the background upper layer controls and the background border radius controls. Advanced backgrounds can be a color, an image or even video. Preset - Presets offers Fill Space Equally, Fill Space, No Shrink and standard. Flex Grow - Flex grow allows you to set how that container should grow. For example, if you set Flex Grow to 1 and had another container set to Flex Grow 1. Both would take up equal space within the bar. If however, you set one container to Flex Grow 1 and the other container to Flex Grow 2. That container set to Flex Grow 2 will take up twice as much space as the container set to Flex Grow 1. Flex Shrink - Defines how much the flex items will shrink relative to the other containers within your bar. Flex Basis - If this is specified it determines the initial size of the flex item before any available space is distributed according to the other factors from the remaining flex controls. Right - Sets the right-hand side margin. Left - Sets the left-hand side margin. Link Sides - Link all sides of the border to control all border radius options at the same time, rather than configuring each value individually. If you unlink sides. You can set the border-radius controls individually. X-Offset - Set the offset of the border shadow for the X-axis. Y-Offset - Set the offset of the border shadow for the Y-axis. Lastly, every header or footer has to have elements, they are after all that actually show the content. The elements in the template we're using are Image Scaling, Navigation Inline and Navigation Collapsed. Elements are made up of multiple different controls each of which is covered in the above article. 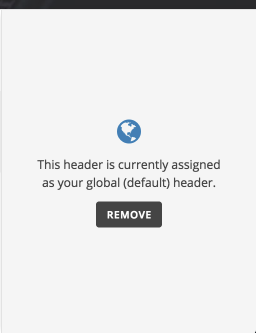 You can assign headers globally. Which means the header/footer will show up everywhere on your site that doesn't have a specific header/footer applied. For example, you have one global header and then a specific header for your about page. Your global header shows on every page apart from your about page as that has a specific one assigned. You can also assign headers or footers to individual pages, posts, and custom post types, the front page, the posts page (your blog) or all pages, all posts or all custom post types and archives. This gives you the ultimate flexibility in creating headers and improving the user experience of your website with specific headers for specific pages. Say you have a landing page and don't want your visitors randomly browsing around your site till they read that page. Create a new header, set up some anchor links. Assign the header to that page, and et voliá your custom header is set. If you have hundreds of posts, pages or custom post types. You can use the search bar on the right-hand side to find the pages and posts you want to assign your header to. This searches in real time and returns the results instantly. If you click on the three bars in the top left you'll be able to quickly navigate the font manager, content builder, header builder, footer builder and theme options. The Footer Builder works in the exact same way as the Header Builder including assigning and un-assigning, bars, containers, and all elements. 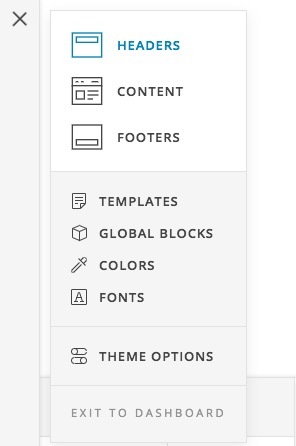 Think of the footer builder as the header builder flipped. Everything works the same, it's just displaying at the bottom of your website rather than the top. Not responsive header or site? How to achieve this basic header layout in Pro? Inline navigation or button header - is there a reason not to use button? How do I change the text for navigation layered? SOLVED How to assign a footer in Pro? Is there any way to downgrade from Pro to X? Pro Theme: Static Area on Left Side with Normal Functions to the Right? Cornerstone will not activate in PRO? X Theme Pro - How Can I Make the Header Responsive? Assign a Header "Pro" on not listed pages without "make it global"? How to make this header "break" at smaller screen widths? Different header depend on device? How to add two adds areas on each side of my boxed-layout? Tutorials and videos on using X Pro? How do I set a featured image on a blog post in Xpro? Add TikTok to social footer? One-Page Menu scrolling scrolls too far (to nearly third past the section)? Possible to change Pro licence I bought to X?